Precision rulers of light (laser frequency combs) span millions of frequencies of light, and can operate from the mid-infrared through the visible to the extreme ultraviolet. They are at the heart of new technologies such as optical atomic clocks, molecular fingerprinting and a noninvasive breath analyzer. Although most people have never heard of laser frequency combs, they have become essential to advancing important light-based research and have been instrumental to the development of new technologies over a wide range of applications. It almost sounds like a riddle: What tool has transformed basic scientific research and led to new technologies in so many different fields–timekeeping, medical research, communications, remote sensing, astronomy, just to name a few? It is not a tool that most people have heard of, yet its impact is undeniable: laser frequency combs. These “rulers” of light very simply measure different light frequencies that are evenly spaced. The exact spacing of frequencies is key to manipulating light for various applications. One application has dramatically improved optical atomic clocks. Another is a medical breath analyzer that can detect and measure trace amounts of simple molecules, such as hydrogen peroxide and carbon monoxide, to diagnose diseases. Laser frequency combs are also used as precision rulers to search for exoplanets outside our solar system. In the lab, experimental physicists use them to watch chemical reactions unfold in real time. These laser combs produced thousands of separate colors, or frequencies, of laser light, all perfectly overlapped in time and space. When these frequencies are displayed on a graph, they are sharp, perfectly even-spaced spikes, resembling the teeth of a hair comb. The first laser frequency combs included frequency “teeth” spanning parts of the visible and near-infrared spectrum. Because the colors were evenly spaced, like the marks on a ruler, scientists recognized the potential of laser frequency combs for precision measurement and as tools for better understanding our world. Today, laser frequency combs span millions of frequencies of light from the mid-infrared through the visible to the extreme ultraviolet, with the range continually expanding. They measure the frequency of light emitted by lasers, stars, nebulae, molecules and atoms. And, once they are extended into the spectrum’s x-ray region, scientists will even be able to peer inside atomic nuclei. 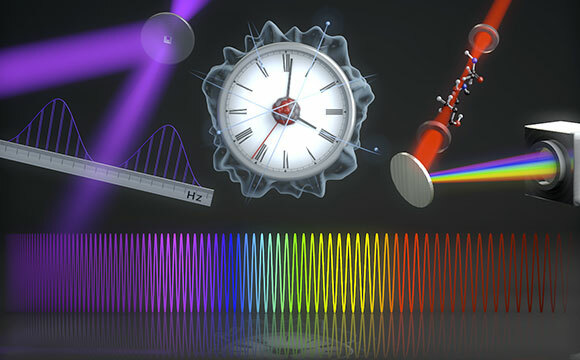 An ultrastable atomic clock whose laser frequency comb can control the entire visible spectrum of light. A mid-infrared-comb-based molecular analyzer that can be used to study chemical reactions and analyze breath. New extreme ultraviolet laser frequency combs that are opening up new measurement frontiers in the study of atoms and nanoparticles. The Ye group’s atomic clock uses strontium atoms held in a crystal of light to generate “ticks” for timekeeping. The atoms are stimulated with an ultrastable laser of 700-nanometer red light. This laser is connected to a laser frequency comb. Only one of the millions of comb lines connects to the clock’s laser, but once the comb finds the right color, it supplies information about all the other colors, too. Because of the astonishing precision of the grand-scale frequency comb, the new atomic clock is more than just a clock. In the future it may be used to map the Earth’s gravitational field, perform tests of fundamental laws of physics, including dark matter searches, and explore the quantum behavior of many atoms working collectively. Ye’s group has extended laser frequency combs to the mid-infrared and shown that they may transform the world of molecular spectroscopy, offering new technologies based on their sensitivity in detecting molecules. For instance, the group has used mid-infrared frequency combs to fingerprint simple molecules like water and carbon dioxide. Recently, the group worked with medical researchers to develop a comb-based noninvasive breath analyzer to identify specific molecules found in human breath. The device identified trace amounts of hydrogen peroxide in the presence of a much larger amount of water. The detection of hydrogen peroxide provided advance warning for patients developing acute respiratory distress syndrome. In a related experiment, a mid-infrared-laser frequency comb device was able to show that a new sterilizer, which effectively kills bacteria and spores, was producing ozone, hydrogen peroxide, nitrous oxide, and nitrogen dioxide. The Ye group is currently using a mid-infrared frequency comb to investigate complex molecules such as volatile organic compounds found in human breath. However, those compounds consist of many atoms that have complicated, and sometimes undecipherable, spectroscopy signatures at room temperature, making fingerprinting impossible. However, the group has discovered that if volatile organic compounds are cooled to low temperatures, they will have distinct fingerprints. Their detection in breath will aid doctors in diagnosing lung cancer. The group is also using a mid-infrared laser frequency comb to learn about chemical reactions. Because a frequency comb provides spectral information across a vast landscape, researchers can watch molecules as they hang out together. They can also observe which reaction pathway the molecules take under different conditions. The researchers can fingerprint the molecules they start with, any new molecules that are made during a chemical reaction and the molecules they end up with. Cutting-edge research on laser frequency combs also includes their development in the extreme ultraviolet. Recently, the Ye group showed that extreme ultraviolet frequency combs are now nearly as good as their visible light counterparts. Possibilities for the near future include studying highly charged ions, building precision nuclear clocks, making nuclear isotope selections and exploring electron behavior in intense light fields. Be the first to comment on "How Laser Frequency Combs Transformed Basic Scientific Research"